“Oh look, Steff— how charming is this? !”, I proclaimed to my roommate as we were approaching what would be the location of our weekly roommate dinner date. 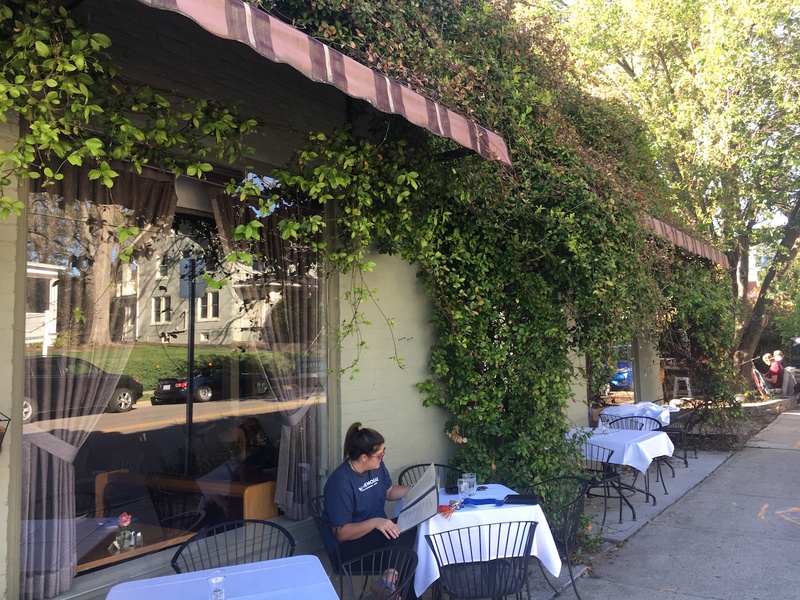 Beautifully accented by vines climbing up the exteriors, I took note how the symmetrical awnings on the front of the building are perfect for accommodating outdoor dining during all four seasons. 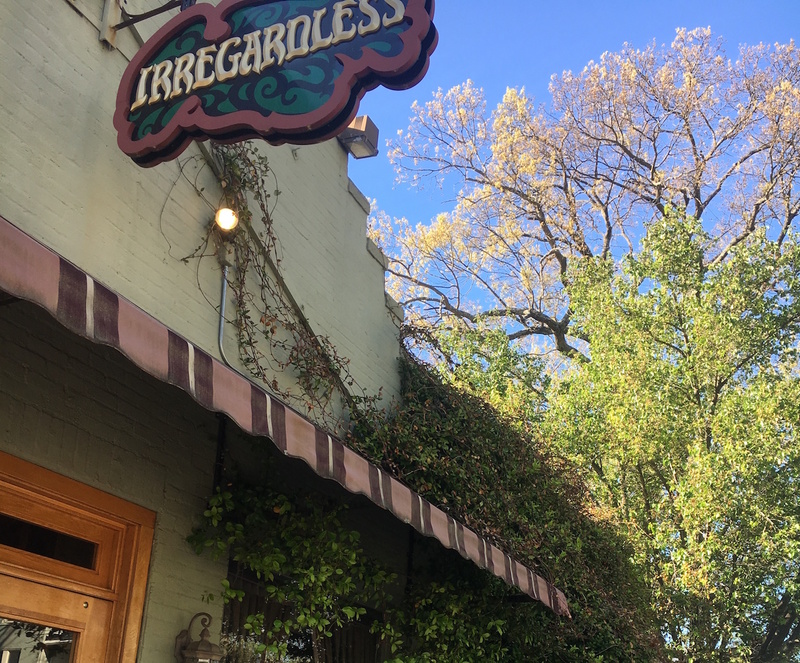 Nestled along what was once known as a quiet corner of Morgan Street, lies the humble abode of a local Raleigh restaurant landmark, Irregardless Cafe. Since first opening its doors in 1975, Irregardless Cafe has significantly added a new meaning behind what is means to be in the food & service industry. Arguably, Irregardless Cafe may very well be THE trendsetter before its time. 10- steps ahead of the curve, Irregardless Cafe has long served as a pioneer when it comes to social responsibility and implementing environmental practices such as sustainability and “going green”. In growth from its humble beginnings strictly as the city's first vegan and vegetarian restaurant, Irregardless Cafe has since uniquely extended its offerings incrementally to include poultry and pescatarian friendly options as well. Looking over the menu upon being seated outside, every few minutes we’d find ourselves happily smiling at passing families, only to watch them enter the same entrance we did moments earlier. Having heard nothing but wonderful remarks about their extensive menu, we were eager to discover for ourselves what the buzz was all about. Still in awe over the character and charisma as we handed back out menus to the waitress, my roommate and I quickly could see why this is considered a local treasure. Tonight, I settled for the chicken pita— sans pita. Rather than substituting for the gluten-free crackers, I opted for a lighter option and had it served over a bed of lettuce. 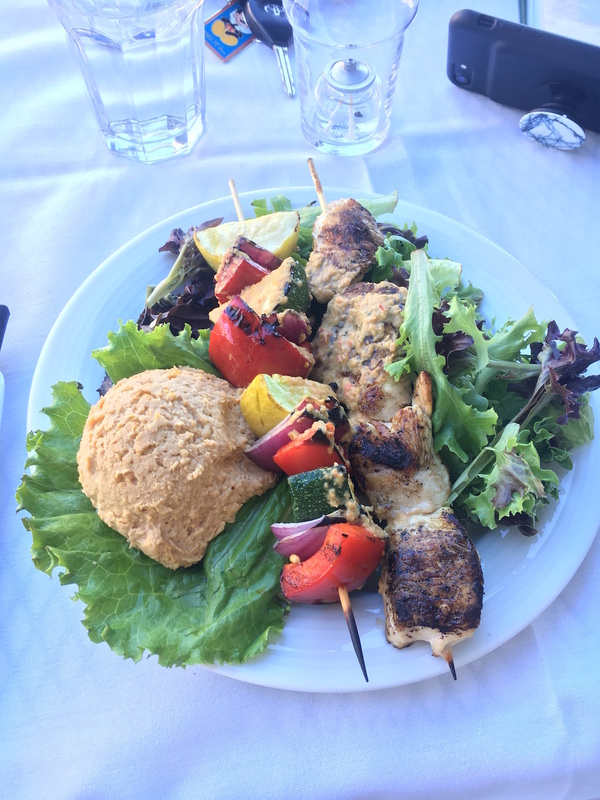 Served with a grilled, fresh vegetable skewer and side of pita, the spices used to flavor the grilled chicken were tastefully played up as I dipped my them in my hummus alongside my veggies. Passionately going against all odds, from day one, owner and executive Chef Arthur Gordon has wholeheartedly believed in the importance from utilizing the farm-to-table initiative. Incorporating the use of foods grown within their own community garden which opened in 2012, Gordon has made it a priority to also give back to the community that has helped keep his passion alive for so many years by donating a portion of the crops to volunteers and low-income residents within the neighborhood. What he once thought was just a brilliant idea to gain experience within the kitchen prior to attending culinary school graciously morphed into an experience worth so much more. Over 40 years later, Gordon is yet to return to culinary school. And let's face it, at this point he probably never will — nor does he need to. Make sure to check out Irregardless cafe soon if you have yet to experience this authentic, Raleigh treasure. They are open for both lunch and dinner Monday - Friday, with a wide offering of nightly live music in the evenings. Also, be sure to pay a special look at their events calendar as they offer unique experiences such as cooking lessons from time to time!